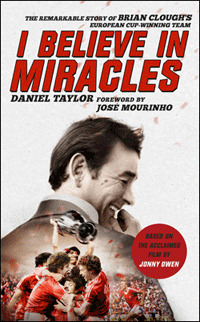 Stories of Cloughie's unique approach to training sessions are among the highlights of this book which describes the epic five-years at Forest in which the Master Manager turned a struggling Second Division side into the Kings of Europe. Striker Tony Woodcock recalls how the players would have to play 'hide and seek' in the City Ground stands - on days when they weren't running through nettles near the basic training pitch next to the River Trent. "Maybe one lap of jogging round the pitch," Woodcock remembers, "then he'd shout: 'Last man out of sight' and there would be grown men scrambling up to the directors' box, hiding behind the seats and looking at each other thinking: 'What are we doing here?'" Daniel Taylor adds: "The loser - the last man out of sight - had to go first through the nettles the next time." Sometimes the players wouldn't even get changed. They would have a relaxing walk along the banks of the Trent instead. The stories of Forest's dramatic rise to the top of European football flow as smoothly as Clough's classic counter-attacking football. The book reminds us how critics claimed the Forest bubble would burst. But Clough took great delight in proving them wrong, as did the players. The sceptics included the former Arsenal goalkeeper and BBC pundit Bob Wilson. Said Clough: "You win something once and people say it is all down to luck. You win it twice and it shuts the buggers up." The book's foreword is brimming with praise for Clough from Jose Mourinho. "He had all that self-esteem and big self-belief," says the Portugese manager. "He was very confident about himself, and from what I know about him he was very comfortable with the attention. Maybe because Brian Clough was such a huge personality, with so much charisma, everyone remembers his quotes and the stories and a few people forget his talents. "He didn't win two European Cups with Nottingham Forest just because of his charisma. History cannot delete what he and Nottingham Forest did - their results, the cups, the achievements, absolutely unbelievable achievements. Mourinho adds: "I have huge respect for what they did. I think if Brian Clough was around today, we would get on." The book, which accompanies the acclaimed film of the same name, costs £16.99 and is published by Headline (2015).